It was hard to put a team together ... until they found out who they were playing. Adam Sandler stars as a former pro football quarterback who suddenly lands in a maximum security prison. Along with fellow inmates Chris Rock and Burt Reynolds, he must put together a motley group of cons to play a no-holds barred grudge game against the very guards who punish them. $26.078 million on 3634 screens. Never underestimate the appeal of Adam Sandler. His remake of 1974’s The Longest Yard got consistently negative reviews and looked like a lackluster project, but it proved to have good legs at the box office. Many predicted that it’d stage a big opening weekend and then collapse, but that didn’t happen. Instead, the movie held on well and took in a total of $157 million, a take that plops it close to Big Daddy and The Waterboy as Sandler’s biggest hits. As with the original flick, Yard introduces us to former pro football player Paul Crewe (Sandler). Now a drunken has-been who can’t live down a accusation of cheating, Crewe steals his rich girlfriend Lena’s (Courtney Cox) car and ends up intentionally destroying it with the aid of many cop cruisers. Not surprisingly, this gets him in trouble with the law, and the authorities arrest him. Crewe ends up at Allenville Penitentiary in rural Texas. Captain Knauer (William Fichtner) runs the prison semi-pro football team and threatens Crewe to resist the requests of Warden Hazen (James Cromwell) to get involved with it. Crewe initially follows these orders, but matters soon change. When Crewe advises the warden that his team needs a tune-up game, Hazen orders the beleaguered inmate to form a squad made up of convicts. Crewe runs into some obstacles but slowly puts together his team along with the help of “the Caretaker” (Chris Rock), and he takes on former football star Nate Scarborough (Burt Reynolds) as his coach. 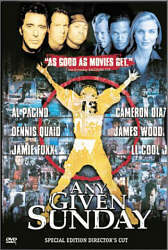 The movie follows the assembly and training of Crewe’s crew of misfits and losers as they work toward a seemingly impossible goal: a win over the guards. Although I didn’t care for the 1974 Yard, I held out moderate hopes for the remake. I thought the original flick had a lot of potential that it just couldn’t reach, but perhaps the new version would work out better. Nope! Maybe in 30 years we’ll get a third version of the flick that’ll finally muster a lively and entertaining piece, but I won’t count on it. The 2005 Yard stands as strike two against the story. To its credit, I will say that the 2005 version works better than the 1974 take. Sloppy at best, incoherent at worst, the prior flick scored a few points due to its premise and a few more through a good performance from Reynolds. However, the film suffered from seemingly random editing and a story that rambles into oblivion. For all its flaws, at least the 2005 Yard offers a significantly tighter experience. It faithfully adheres to the original in many ways, though political correctness changes a few notorious sequences. 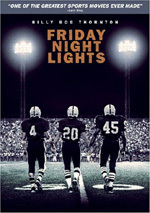 It doesn’t stick to the old flick’s meandering storytelling, though, as it pursues its goals in a more concise manner. The 2005 Yard also veers more firmly into comedic territory. The original flopped between humor and drama without much rhyme or reason. While the new flick goes for pathos at times and rarely enters the absurd territory of most Sandler efforts, it still sticks with the gags and jokes most of the way. This benefits it, at least in the sense that it creates a more coherent tone. Too bad that surprisingly little humor results. I’ve often defended Sandler over the years, but this becomes more and more difficult with time. For every good film like 50 First Dates, we’ll get a stinker or two such as Anger Management. Yard continues this trend of inconsistency, though it probably falls toward the bottom of the list. Too little amusement results from the gags, though the chemistry between Sandler and Rock occasionally yields decent results. Not much else clicks, including Rock’s frequent attempts at racial humor. Those jokes get old quickly and don’t add anything to the movie. One other annoyance comes from the film’s near-constant use of rock or rap songs along with montages. These fly at us with alacrity and wear us down just as quickly. They feel like cheap attempts at drama and passion. Instead, they simply come across as feeble filmmaking devices from a director who can’t think of any other way to evoke the desired emotions. 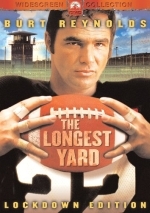 Adam Sandler’s made worse movies, and at least the 2005 Longest Yard improves on the original. That said, it drags on for too long and provides precious little humor or anything else that seems memorable. It has a few decent bits but fails to connect in a meaningful or entertaining way. The Longest Day appears in an aspect ratio of approximately 2.35:1 on this single-sided, double-layered DVD; the image has been enhanced for 16X9 televisions. Although it made a comeback toward the film’s conclusion, most of the time Yard offered a surprisingly muddy transfer. Edge enhancement created the majority of the concerns. Haloes popped up around objects with moderate frequency, and these led to some fuzziness. Sharpness ranged from pretty solid to mildly indistinct throughout the film, though it usually remained acceptably well-defined. I saw no issues with jagged edges or shimmering, and other than one or two specks, source flaws were absent. To match the desolate Texas location of the prison, the palette usually tended toward desaturated tones. Matters got a bit brighter during the climactic football game, but even then, I thought the colors were subdued and somewhat flat. Still, the DVD seemed to replicate the production design faithfully, despite a few scenes that looked a bit messy. Blacks were acceptably dense and tight, but a few low-light shots presented greater opacity than I’d like. As I watched the movie, I figured I’d give it a “C+” because of the problems mentioned above. However, the football game worked well enough to boost my grade to a “B-“. Granted, it took place in daylight, a setting that usually looks good on film. Nonetheless, those scenes worked well and gave the transfer a kick that it lacked during most of the preceding moments. On the other hand, the Dolby Digital 5.1 soundtrack of The Longest Yard provided consistently satisfying. Between the football scenes and the prevalence of rock/rap music, the audio got a lot of opportunities to blast us, and it took advantage of them. The soundfield was nicely broad and well-developed. In the front, the mix placed elements in the appropriate spots and meshed them smoothly. The surrounds added a lot of punch to the track. They actively boosted the music and also contributed many crunches and hits during the football scenes. Make no mistake: this wasn’t a standard “comedy mix”, as the audio came to life well. Strong audio quality made the soundfield work even better. Speech was consistently natural and crisp, as I noticed no edginess or issues with intelligibility. Music boasted clean highs and deep lows, especially during the many rap songs; those pumped out the bass from the subwoofer. Effects also demonstrated solid clarity and definition. Once again, the football bits packed the greatest impact, as the low-end made them forceful. Although it lacked the great breadth I’d require of an “A”-level soundtrack, this mix certainly stood out as very good. When we check out the extras of Yard, we start with some featurettes. First Down and 25 to Life runs 20 minutes and 55 seconds as it presents a standard mix of movie shots, behind the scenes bits, and interviews. We hear from director Peter Segal, production designer Perry Blake, 1st assistant director John Hockridge, executive producer Michael Ewing, QB coach Sean Salisbury, costume designer Ellen Lutter, and actors Adam Sandler, Nelly, Michael Irvin, Terry Crews, Chris Berman, Brian Bosworth, Chris Rock, Bill Romanowski, Steve Austin, William Fichtner, Kevin Nash, Bill Goldberg, and Burt Reynolds. They discuss sets and shooting at an actual prison, problems with weather, themes, filming in the mud, the actors and their football training, outfits, the use of real football players, and the climactic game. As I went into “Down”, I expected a fluffy promo piece. While a few decent tidbits emerged, that’s essentially what I got. There’s a lot of hype and hyperbole but not much hard data. It moves quickly and tosses out enough to merit a look, but don’t anticipate anything substantial from it. Next comes the five-minute and 28-second The Care and Feeding of Pro Athletes. We get notes from Segal, Crews, Goldberg, Romanowski, Rock, Reynolds, Nelly, Sandler, caterer Fred Gabrielli, Lutter, Austin and actors Bob Sapp and Joey Diaz, As implied by the title, this covers who ate what on the set. We learn about all the caterering requirements and what it took to feed all the mega-athletes. It’s fairly insubstantial but becomes marginally informative. Yet another light program comes to us via Lights, Camera, Touchdown! It fills five minutes, 35 seconds with comments from Segal, Crews, Sandler, Austin, Nash, Fichtner, Romanowski, Irvin, football coordinator Mark Ellis, and arena football player Jerry Sharp. As you might expect, they concentrate on how they executed the football sequences. Again, we get a few good tidbits as we learn some details about those elements. Unfortunately, the tone remains too puffy for us to get any real substance. Extra Points offers five short clips, all of which come with narration from Segal. We get “Ride Along” (48 seconds), “Gearing Up” (0:34), “Hornet’s Nest” (0:22), “Ping Pong” (0:23) and “Crowd Control” (2:26). These look at some visual effects shots used in the film. They go by quickly and the absence of a “Play All” option stinks, but they provide a few neat details. After this we find nine Deleted Scenes. These offer “Play All” and run six minutes, 13 seconds via that option. Many offer extended or alternate versions of existing sequences, and none of them stand out as particularly memorable, though it’s fun to see Chris Rock try a few different lines about Switowski’s broken nose. We can watch them with or without commentary from Segal. He gives us general notes and makes sure we know why the scenes got the boot. An inevitable Music Video appears for Nelly’s “Errtime”. It sounds like a million other rap tunes and mostly looks like a million other rap videos, though a coda with Adam Sandler adds a little life. Here Comes the Boom provides a two-minute and 43-second musical montage. It shows lots of football shots and is wholly uninteresting except for a slightly alternate line from one scene that appears at its end. Fumbles and Stumbles presents three minutes and 55 seconds of bloopers. Should you expect anything other than the standard mistakes and silliness? No – despite the presence of comedic talents like Sandler and Rock, this is the usual nonsense. The DVD opens with a bunch of ads. We get promos for the 2005 Honeymooners movie, Beavis and Butthead: The Mike Judge Collection, Hustle and Flow, the 2005 Bad News Bears remake, The Oprah Winfrey Show 20th Anniversary Collection, Everybody Hates Chris, and the original Longest Yard. These also appear in the disc’s Previews area. A minor improvement on the disappointing original version of The Longest Yard, the 2005 remake offers scattered laughs but not much else. Instead, it adds up to a lot of lost potential and wasted talent. The DVD presents erratic but usually acceptable picture plus excellent audio and a mediocre set of extras. If you really liked this flick, the DVD might be worth your time, but I can’t advise anyone else to examine it.